John Hartwell Cocke, Jr., son of the builder of the present house, sold Mount Pleasant to his sister Sally and her husband, Nicholas Faulcon, in 1809. Cocke had become disgruntled with eastern Virginia, especially with its depleted soil, and wanted to move west. With proceeds from this sale, he began construction of a Jeffersonian-inspired dwelling on property he inherited in Fluvanna County that he named Bremo after a seventeenth-century family tract in Henrico County. Soon he became enchanted with Romanticism, both as a philosophy and as an architectural style. As an early proponent, he had Bremo Recess built in 1834–36 as a romantic revival building, using Bacon’s Castle’s Jacobean appearance—particularly its triple-stack chimneys—as a model. Alexander Jackson Davis was one of the most recognized architects working in this idiom. In Virginia, he is especially noted for his 1845 design of Belmead in Powhatan County, the home of Philip St. George Cocke, son of John Hartwell Cocke, Jr. and Ann Barraud Cocke of Bremo. 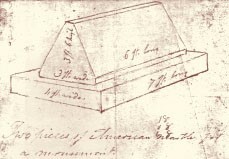 Alexander Jackson Davis’ sketch for the Cocke cenotaph. 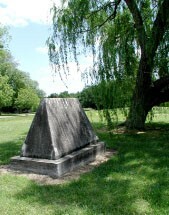 About 1852 John Hartwell Cocke, Jr. commissioned Davis to design a family cenotaph that details the family genealogy and honors the memory of his ancestors. It was placed at Mount Pleasant. Davis’ sketch survives (now in the University of Virginia Library, Special Collections Department), calling for “Two pieces of American marble for a monument.” Oddly, it was done in a severe Greek revival style, the antithesis of the romantic revival style for which both Cocke and Davis had shown such fondness.